Scenes from the 2017 Bronko Nagurski Award presentation banquet and an earlier Nagurski High School Leadership Forum on Dec. 5 in Charlotte, N.C.
2017 Bronko Nagurski Award winner Bradley Chubb of North Carolina State and FWAA president Dave Jones. Photo by Michael Strauss. Georgia coach Kirby Smart was the keynote speaker at the 2017 Bronko Nagurski Award presentation banquet. Photo by Michael Strauss. The scene at the presentation banquet for the 2017 Bronko Nagurski Award, sponsored by the Charlotte Touchdown Club. Photo by Michael Strauss. Placecard awaiting the arrival of Bronko Nagurski Award winner Bradley Chubb of North Carolina State. Photo by Michael Strauss. The five finalists for the 2017 Bronko Nagurski Award, left to right: Bradley Chubb of North Carolina State, Minkah Fitzpatrick of Alabama, Roquan Smith of Georgia, Josey Jewell of Iowa and Ed Oliver of the University of Houston. Photo by Michael Strauss. A table setting for the Bronko Nagurski Award Banquet, sponsored by the Charlotte Touchdown Club. Photo by Michael Strauss. Bradley Chubb of North Carolina State, winner of the 2017 Bronko Nagurski Award. Photo by Michael Strauss. Ed Oliver of the University of Houston, a finalist for the Bronko Nagurski Award, at the Nagurski High School Leadership Forum. Photo by Michael Strauss. Iowa linebacker Josey Jewell, one of five finalists for the 2017 Bronko Nagurski Award, at the Nagurski High School Leadership Forum. Photo by Michael Strauss. The stage is set for the five Bronko Nagurski Award finalists at the Nagurski High School Leadership Forum. Photo by Michael Strauss. Ross Browner, 1976 winner of the Outland Trophy and this year’s Bronko Nagurski Legends Award winner, shares a laugh at the Nagurski High School Leadership Forum. Photo by Michael Strauss. Ross Browner, winner of the 1976 Outland Trophy and this year’s winner of the Bronko Nagurski Legends Award. Photo by Michael Strauss. Adam Zucker of CBS Sports was emcee at the presentation banquet for the 2017 Bronko Nagurski Award. Photo by Michael Strauss. 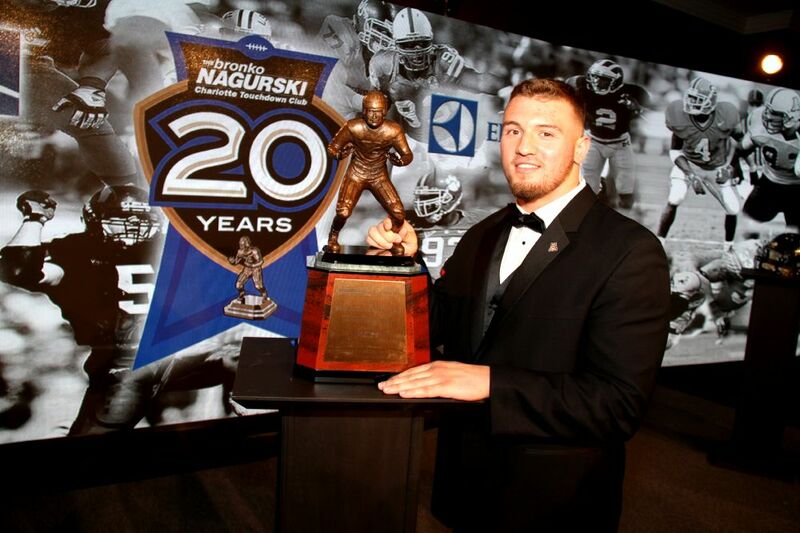 Arizona linebacker Scooby Wright, III winner of the 2014 Bronko Nagurski Trophy. CHARLOTTE – Arizona linebacker Scooby Wright III claimed the Bronko Nagurski Trophy on Monday night, winning the Football Writers Association of America’s annual award for the top defensive player in the country. Wright, a 6-1, 246-pound sophomore, accepted the award at the event that has been sponsored by the Charlotte Touchdown Club for 20 consecutive years. He becomes the second Arizona player to win the award after the inaugural winner Rob Waldrop in 1993 and the first Pac-12 player to claim it since Terrell Suggs of Arizona State in 2002. Wright is just the second sophomore to win the award, joining Ohio State linebacker James Laurinaitis, the 2006 winner. Wright has gone from a player recruited by only a few schools – a two-star recruit on the West Coast – to a tackling machine at Arizona (10-3), ranked 10th in the final College Football Playoff rankings. 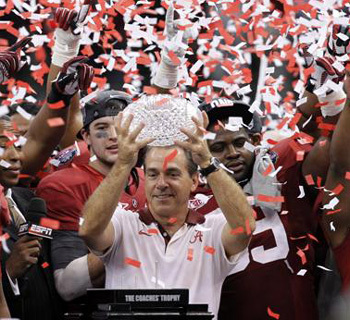 Charlotte, N.C. — The Charlotte Touchdown Club, in conjunction with the Football Writers Association of America, has announced that Alabama Coach Nick Saban will be the keynote speaker for the 2014 Bronko Nagurski Awards Banquet scheduled for Monday, December 8th.